We're making some progress on the bump as well as the kitchen this month. After taking these pics I am realizing that I'm noticing the bump more so then it is really showing but I swear it's there. We are picking out our countertops today so I'm hoping in the next month the kitchen will be basically finished! Maternity clothes? Pants yes. My maternity pants still don't stay up well but my regular pants don't botton so loose maternity pants it is. I also got a pair of yoga pants that I am absolutely loving. Almost all of my dresses and tops still fit but I have bought 2 maternity shirts for days when I want to be really comfortable. Sleep: Sleep has been hit or miss. I'm still having vivid dreams and getting up a lot but I have gotten a couple of good nights sleep recently. I also can't really sleep in anymore. I get up at 8 am pretty much regardless of how late I could sleep in. Movement: Definitely a large increase in movement this month. There have been a lot of flips and kicks and a couple of possible cases of hiccups. Food cravings: I think this has a lot more to do with our kitchen reno and less to do with the pregnancy, but I'm craving a home cooked meal. We've been eating out for about a week and a half and I'm a bit over it. Symptoms: I would like a new pair of hips but that is old news at this point. New this month is the worse case of heartburn I've ever experienced (It woke me up ever time I managed to fall asleep for a night) and congestion. I also have been very weepy. Pretty much anything can get me balling my eyes out and I don't even know why I'm crying. The baby has also decided to occupy the space where my lungs used to live so I can't walk up a flight of stairs without taking a break. 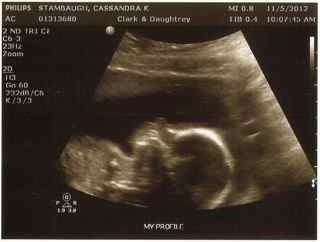 Feeling toward Pregnancy: I'm feeling a bit beat up. I desperately want to go for a run but I can barely walk at the end of a day of normal walking. I'd like to feel a bit better but I am starting to get a real bump which is fun. 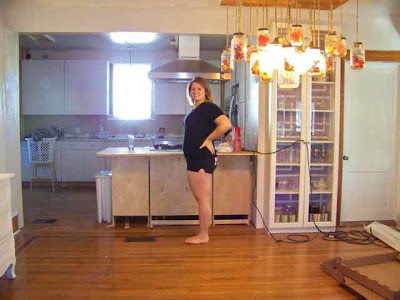 What I am looking forward to: Finishing the kitchen so that we can start working on the baby's area. Milestones: Finding out the gender. So excited about your baby boy!! You're doing great and look great! The baby bump will show more soon.Take care! So happy for you both. Glad you have expanded the kitchen. It's going to look great!